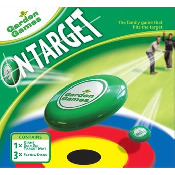 This On Target Interactive Game is guaranteed to bring hours of fun for both children and adults. This game includes a waterproof target and 3 flying discs. Throw the discs at the target and aim for the centre for top points.